Would you like to spend less cash on any Lexmark toner? Getting a Lexmark Optra E-310 toner with us makes it a possibility for you to save plenty of time and expense. With Cartridge Save's competitive prices in addition to our low price promise, you'll be convinced of enjoying the very best offer on your Lexmark Optra E 310 toners. It's Cartridge Save's aim to satisfy each shopper by providing reasonable rates along with best quality Lexmark Optra E310 toner which will perform correctly every single time. If you have previously purchased Lexmark toners from us before then you will appreciate that our speedy delivery service is a major benefit. The particular great value Lexmark Optra E310 toner cartridge can be bought online on our secure shop so don't lose out and place an order as soon as possible while stocks last. Cartridge Save have an industry leading customer care team to ensure that buying Lexmark Optra E-310 toner is a swift as well as simple shopping experience. Keep in mind that Lexmark Optra E 310 toners dispatched by Cartridge Save are also guarded buy our no quibbles money back guarantee which allows you the chance to get a 100% refund so customer care is never far away. To find the best deal for Lexmark Optra E310 laser toner cartridges you simply cannot beat ordering from Cartridge Save. The Lexmark Optra E310 black and white laser printer is an affordable choice for the small business that needs a network-friendly printer. Its features are sufficient for low volume jobs, and users can also perform a few upgrades on the Optra E310 laser printer to improve its overall efficiency. However, they might still be disappointed with the sub par print speeds, poor output, and absence of colour printing. 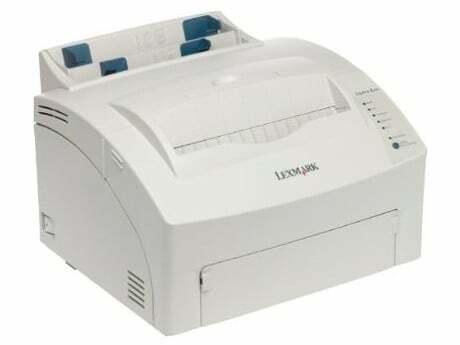 The semi-rugged appeal of the Lexmark Optra E310 printer has something to do with the design of the enclosure, which measures 13.6 inches wide, 10.8 inches tall, and 14.4 inches deep. This compact device with a desktop form factor weighs 7.48Kg, and it runs on a Toshiba 67MHz processor with 2MB of built-in memory. An additional four-megabyte flash memory is also installed. The Optra E310 uses curved and straight paper paths, and provides USB and parallel connections. Extensive language simulation and good postscript support is available. The RAM of the Lexmark Optra E310 monochrome laser printer is upgradeable to 66MB. Dual media paths offer more versatility when printing on speciality paper including transparencies, labels, envelopes, and business cards. Plug-and-play compliance makes the Lexmark Optra E-310 mono laser printer easier to install. Recycled Lexmark Optra E310 toners are offered as a cheaper alternative to genuine Lexmark toners and this can help users on a low budget to save money . The Lexmark E310 can only print in monochrome. Despite being aimed at workgroups, the device lacks built-in networking features. The low media capacity makes it inefficient for heavier workloads. The expansion features of the Lexmark E310 Optra printer are very limited. The quality of very detailed graphics and pictures may decline because of the 600x600dpi resolution.